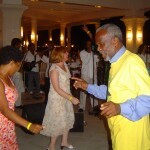 Our Inaugural reunion took place on July 13 through July 17, 2005 at the newly renamed, Sunset Jamaica Grand in Ocho Rios Jamaica. Leading up to this reunion, the family compiled years of notes and then finally unveiled an online family tree consisting of over 700 past and present family members dating back to the late 19th century. This online tree became the center of our celebration and it was truly amazing to witness for the first time, over 180 family members come together to celebrate their heritage. Know Your Roots was an appropriate theme as it kicked off years of reunions to come all in celebration of the family lines. Solomon and Elizabeth are our Adam and Eve. resemblance. “Oh my goodness, he looks just like me!” she said as she ran to get her camera. 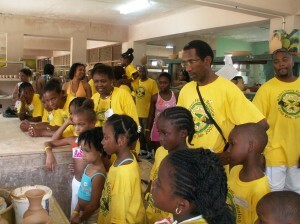 Among the activities was a trip to the famous Dunn’s River Falls. As we all boarded the two buses we really did look like a swarm of bees in our bright yellow shirts. Nights at the hotel were great. Who could forget Deane singing Marley tunes at Karaoke night? Our Reunion spirit was not dampened even by a Hurricane named Ivan that caused everyone to stay inside one day and mingle. At the banquet, Aunt Barbara gave a wonderful speech and history lesson about Solomon and Elizabeth. Another highlight was the unveiling of our first Hibbert Heritage Award that was given to Ferdinand Madden. Uncle Ferdie was sick and the award was accepted on his behalf by Aunt Mavis.